Unit Converter Pro for BlackBerry smartphones is distributed in two versions - the paid full version and the freeware lite version whose database of units is restricted to the 20 most common categories of measurements. 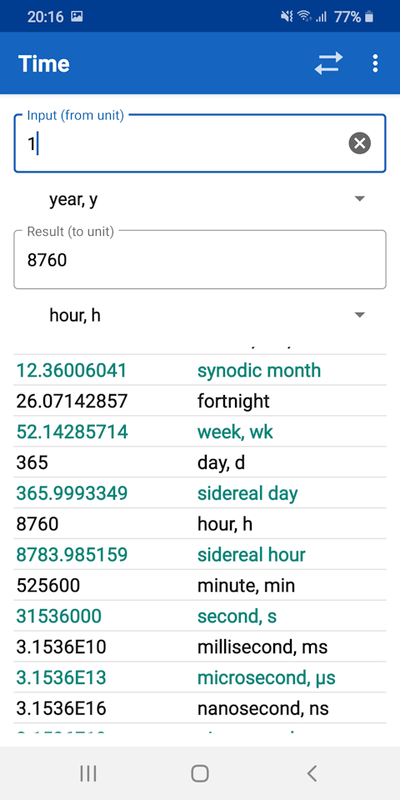 Unit Converter Pro for Android is distributed in two versions - the full version with the complete database of units and the lite version whose database contains the 20 most common categories of measurements. Both versions are currently distributed as a freeware and are available on Google Play (Android Market). Unit Converter Pro is also available for your Palm. It offers over 1500 different units in 76 categories just like desktop version. Unit Converter Pro allows to export its database of units and install it in your Palm. 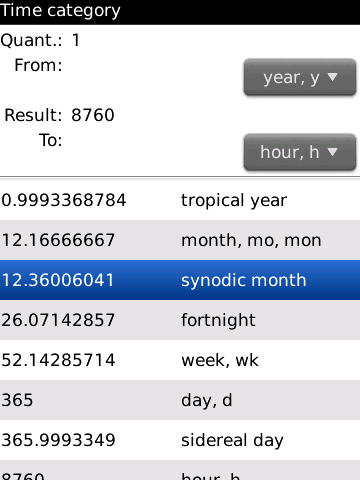 That is why Palm version has also possibility to define custom units and categories. Unit Converter Pro can quickly convert more than 1500 predefined units in 76 categories. It contains the most important conversion factors for length, mass, volume, pressure, and time units. But it provides many high-specialized units and categories, too. Unit Converter Pro supports conversions between combinations of units. The input and the result can consist of various units and this conversion is enumerated in one step, e.g. a length measured in yards, feet and inches into the length in meters and centimeters. 1500 is too many units for effective work. Therefore Unit Converter Pro offers a possibility to manage units and categories. The units and the categories that you don't need for you work can be easily hidden and the rest of units can be sorted in whatever order. Unit Converter Pro offers fully customizable database. You can add, remove, or modify units and categories. You can add units into any pre-defined category or you can create a new category. Unit Converter Pro is available for your Palm and this version is distribute as a freeware. Unit Converter Pro allows to export its database of units and install it in your Palm. Unit Converter Pro allows you to create, customize, and print out conversion tables of every category. It is useful, when you need to convert a unit and you don't have a computer. It gives better abstract about units. Unit Converter Pro allows you to enter simple value and also complex expression as an input of conversion. Unit Converter Pro allows you to customize program behavior such as used font, result format, and program appearance. Unit Converter Pro allows to display all conversion results simultaneously. Unit Converter Pro can quickly locate needed unit or category. For further particulars see the On-line Help. 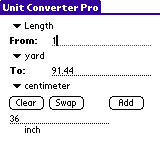 Unit Converter Pro is available online at online.unitconverterpro.com or www.onlineconverter.net. Unit Converter Pro isn't free. It is distributed as shareware. You can use the fully functionally demo for one month. It allows you to try out the program before you paid for it. If you want use this program after the trial period, please register it. We have spent a lot of time on this program and more money makes it easier to continue the development of Unit Converter Pro!